Review: For the 75th release in their long-running Brazil 45s series, the Mr Bongo crew has chosen to reissue some prime "MPB samba jazz" from 1965. 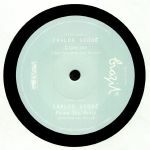 The two tracks showcased here were originally issued on a rare 33rpm 7" single, one which collectors are now willing to pay silly money to obtain. Up first is "Ciumeira", a wonderfully jaunty and celebratory fusion of swinging sixties charm, Mod style organ stabs, smooth vocals and cheery samba-pop grooves. B-side "Rasga Teu Verso" has a more grandiose, easy listening kind of feel, albeit with the addition of punchy MPB horns and summery vocals so infectious that you'll be singing them in the shower in no time at all.